Ive always wondered, what type of wedding dress do you REALLY get for $250? About 3 months ago I went onto ebay and chose a dress, it was LA SPOSA's LAMBEL from their 2009 collection. But a COPY ONLY. It cost me $250 from an ebay seller called Mary-anne bridal. I requested that the back of the dress be changed from button up to lace and sent off an example picture as well as some other photos I found of the designer dress itself. They said this would help them, and the lady who wrote to me on eBay could actually speak English! Anywho, it took me a while to get around to taking my own measurements. There was an instruction page showing how to take the measurements. I also took a photo of myself, front & side, so they could see my shape. The dress took about 6 weeks to make and arrived this week. I am blown away. I swear I would've paid $3k for this in a shop. It has layers and layers of lining, the inside of the garment is perfectly sewn with the panel behind the lace back and some little built in clip things (to hold you in apparently)etc. The bodice is an EXACT replica of the LAMBEL with beautiful beading and the colour was perfect and the fit was perfect with boning throughout. It has a long flowing train. I couldn't think how you could purchase the material for this for under $250! the postage alone on the package cost them $50 (which was included in the total price). I am stunned and I am a fussy person. I did read the feedback for Mary Anne bridal first and got a good vibe. Thank you sending in this review. Most of the reviews that are sent in do not turn out so well. I am glad that you had a good experience with ordering a wedding dress from a China based manufacturer. And I am also glad that you sent in pictures to show us your dress! Your review will help brides that are considering using the source you used. 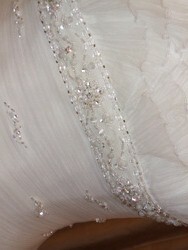 Plus it is good to know which China based manufacturers really deliver a gown of good quality! 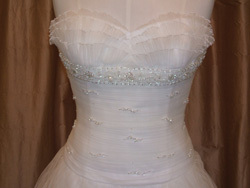 I want to encourage more brides to send in reviews about their experience ordering wedding gowns offshore. If you ordered a bridal gown from a China wholesaler on eBay from a store on the web, and you were pleased with the results, then let us know your experience and send in pictures if you can.